Found one file extension association related to HEC-DSSVue and 1 file format developed specifically for use with HEC-DSSVue. HEC-DSSVue is a Java-based visual utilities program that allows users to plot, tabulate, edit, and manipulate data in a HEC-DSS database file. The graphics produced by HEC-DSSVue are highly customizable and can be saved in various formats, including “jpeg” and “png” (portable network graphics), or for printing or copying to the clipboard for inclusion in reports. HEC-DSSVue incorporates over sixty mathematical functions. 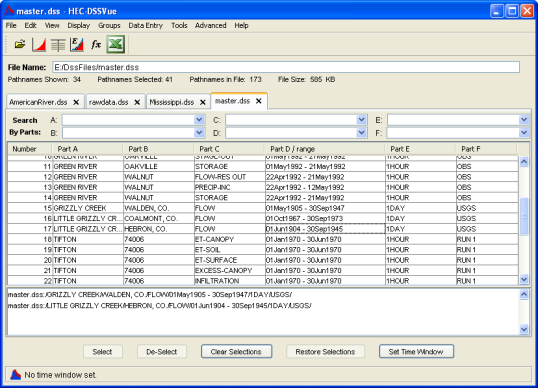 Along with these functions, HEC-DSSVue provides several utility functions that provide a means to enter data sets into a HEC-DSS database, rename data set names, copy data sets to other HEC-DSS database files, and delete data sets. If you need more information please contact the developers of HEC-DSSVue (Department of The Army Corps of Engineers), or check out their product website.